Total hip replacement (THR) for treatment of disabling end-stage osteoarthritis of the hip has been accepted worldwide. The procedure improves quality of life and functional disability significantly.,, The past 10 years has witnessed an increase in the number of THR surgeries around the world over.,,, Despite this worldwide increase and the fact that the first THR in Nigeria was done in 1974, arthroplasty procedures had remained in its infancy until recently as a result of infrastructural decay in public institutions due to prolonged military rule. Gogia et al. in a study showed an overall improvement of 56% at 3 months and 64% at 6 months after surgery. They demonstrated in a study that majority of their patients obtained “excellent” results with THR surgery and follow-up physical therapy. They concluded from the results of their study that THR followed by physical therapy decreases joint pain and improves function in patients with osteoarthritis of the hip. Liu et al. in a cohort study of the epidemiology and surgical outcomes of patients undergoing primary THR on Asian patients demonstrated that the three most common etiologies for degenerative hip arthritis were inflammatory arthropathies, primary osteoarthritis, and avascular necrosis (AVN). They concluded in their study that the patient groups had comparable functional outcomes following THR regardless of the diagnosis. Huotari et al. in a study to determine the outcome in terms of two outcome variables, deep surgical site infections (SSIs) and mortality, carried out an analysis of surveillance data. They did a multivariate analysis and demonstrated that bilateral operations were not an independent risk factor for deep SSIs. They concluded in their study that mortality did not differ between bi- and unilateral total hip arthroplasty (THA) and that simultaneous bilateral surgery did not increase the risk of deep SSIs or death after THA. They further advised that bilateral operations may, however, require specific guidelines regarding antimicrobial prophylaxis. Patient-based self-report questionnaires are an accepted method of evaluating patient outcomes and quality of life. The HHS is the most widely used physician-assessed measure of hip function after THA. The HHS evaluates similar domains as the Western Ontario McMaster Osteoarthritis Index, including patient hip pain and function although it was empirically derived. Outcome assessment of joint replacement procedures allows providers and patients to evaluate the quality of services delivered, thereby adding value to the services provided. To our knowledge, outcome study of a large series of THR like ours has not been published in our environment. Therefore, the aim of this study is to describe the pattern of presentations of our patients with hip OA who have undergone cementless THR, assess the outcome, and identify any variables that affect the outcome. Between November 2008 and November 2013, 72 THR in 62 patients were carried out by the authors at Davidson and Judith Consultants Clinics Enugu, Nigeria. We developed a protocol for the clinic for the selection of patients for surgery and postmanagement [Figure 1]. Based on the above protocol, preoperative assessment was carried out which included radiological and laboratory to rule out infection. Only patients with an erythrocyte sedimentation rate <20 mg/dl and C-reactive protein (CRP) <10 mg/dl were operated upon. Hips that required acetabular reconstruction with antiprotrusio cage were excluded from this study. All patients had a preoperative X-rays of the affected hip which include anterior-posterior, lateral, and Judet's view [Figure 2]. Where there was doubt on the information concerning the integrity of the acetabular walls, computerized tomography scan was requested to assess the configuration of the acetabular walls. 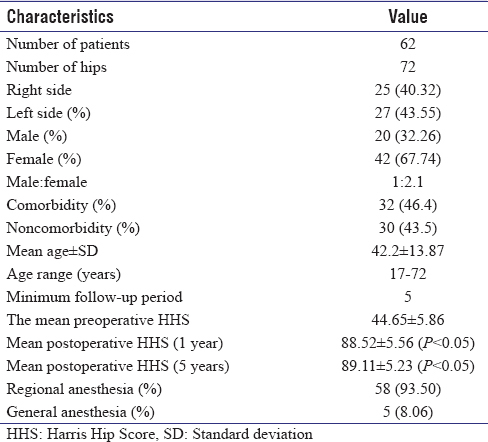 The preoperative Harris Hip Scores (Pre op HHSs) were assessed and the average pre op HHS was 44.65 ± 5.86, with a range of 36–59. The average preoperative packed cell volume was 38.24. The average blood transfusion rate was 2 units, with a range of 0–2 units. The surgeries were carried out under general and regional anesthesia after consideration of the general condition and associated morbidity of the patients. We used anterior lateral approach in all the patients. The Corail stem (J&J, Depuy) was used for the replacement of femoral head and neck, while the Duraloc (J&J, Depuy) as acetabular component. Fixation of the components was achieved primarily by press-fit technique using screws for additional acetabular fixation of the cup where necessary. There was no remarkable blood loss and the average loss was 814 ml. The average postup transfusion was <2 units of blood. Patients had our physiotherapist protocol of rehabilitation; hip muscles strengthening exercise while on bed, sitting out, walking with Zimmer frame, walking with crutches, and discharged in 2 weeks after removal of staples/sutures. Patient had initial postoperative radiographs within 24 h [Figure 2] and subsequent ones taken at the time of assessment of the functional outcome. The postoperative HHSs (post op HHSs) were done at 6 weeks, 3 months, 6 months, 12 months, 24 months, 36 months, 48 months, and at 5 years. We used the IBM SPSS package (IBM Corp., IBM SPSS Statistics for Windows, Version 25.0, Armonk, NY, USA). developed by International Business Machines Corporation (IBM) to analyze our data. Descriptive statistics were calculated for all variables of interest. 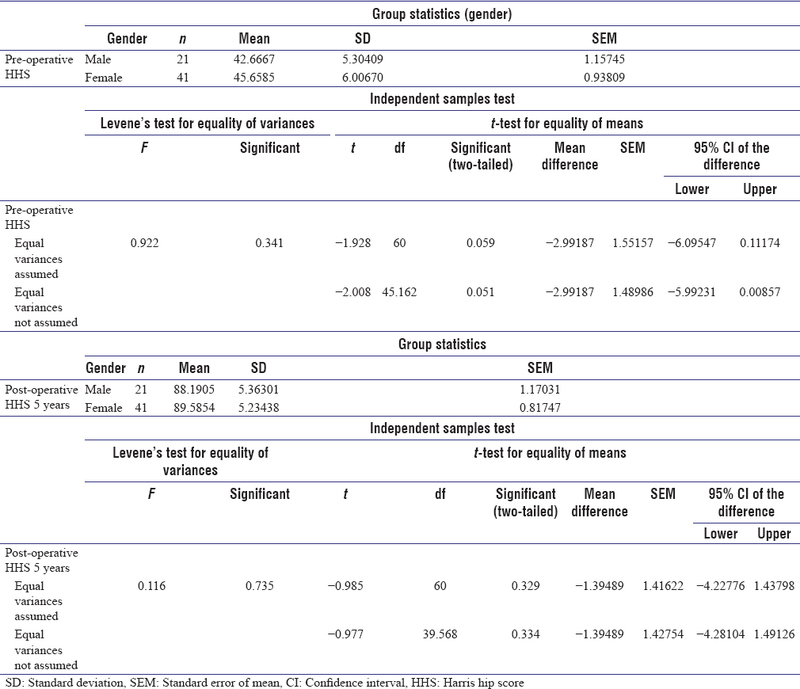 Categorical measures were summarized as counts and percentages, and continuous measures were summarized as means, standard deviations, and medians. 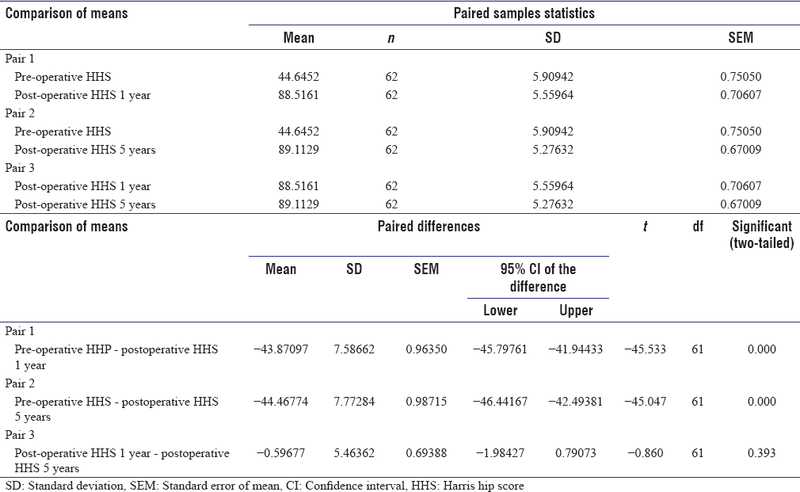 The P values for comparing means of continuous variables such as HHS were determined and we compared the following HHS means [Table 3] using the paired t-test: Pre op HHS and post op HHS at 1 year, pre op HHS, and post op HHS at 5 years, post op HHS at 1 year, and post op HHS at 5 year. We compared the following HHS means for gender [Table 4] using the independent t-test to compare the following means: male pre op HHS and female pre op HHS at 1 year and male post op HHS and female post op HHS at 5 years. 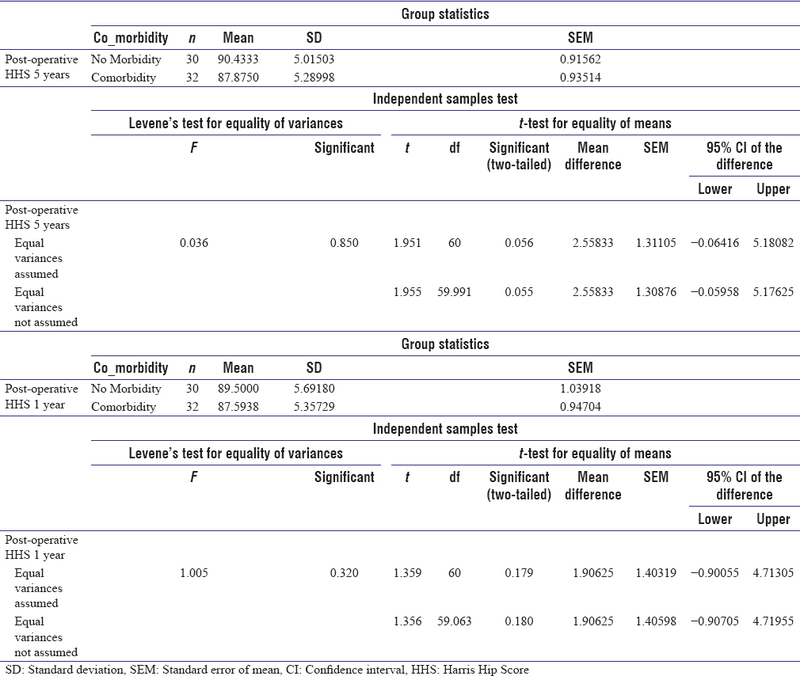 We compared the following HHS means for comorbidity [Table 5] using the independent t-test to compare the following means: Comorbidity post op HHS and no comorbidity post op HHS at 1 year, comorbidity post op HHS, and no comorbidity post op HHS at 5 years. There were 62 patients and 72 Hips. Ten (16.13%) patients had bilateral conditions; 25 (40.32%) patients had right cementless THR, while 27 (43.55%) patients had left THR. Twenty (32.26%) patients were males and 42 (67.74%) were females with male:female of 1:2.1 patients [Table 1]. The most common cause from the study is still primary osteoarthritis which accounts for 51.6%, while the least is AVN of the head of femur seen in hemoglobinopathy (22.58%). Those following idiopathic AVN are slightly higher (22.58%), while posttraumatic is (25.81%) [Table 2]. The comparison of means of HHS shows pre op HHS and post op HHS at 1 year has P = 0.000 (P < 0.05). Pre op HHS and post op HHS at 5 years have P = 0.000 (P < 0.05). Post op HHS at 1 year and post op HHS at 5 years have a P = 0.393 (P > 0.05) [Table 3]. The comparison of HHS means for gender shows male pre op HHS and female pre op HHS at 1 year has a P = 0.341(P > 0.05). Male post op HHS and female post op HHS at 5 years has P = 0.735 (P > 0.05) [Table 4]. The comparison of HHS means for morbidity shows comorbidity post op HHS and no Comorbidity post op HHS at 1 year had P = 0.320 (P > 0.05) and comorbidity post op HHS and no comorbidity post op HHS at 5 years had a P = 0.85 (P > 0.05) [Table 5]. None of our patients had any radiological evidence of aseptic loosening. We had a complication rate of 4.83% which are distributed as follows: dislocation – 1 (1.61%), limb length discrepancy – 1 (1.61%), and pulmonary embolism – 1 (1.61%). The pattern of presentation of our patients showed that 48.39% of them had secondary osteoarthritis due to osteonecrosis as against 51.61% of them that presented as primary osteoarthritis. This is at variance with the Swedish annual report for arthroplasty register, which showed that 83% of their patients presented with primary osteoarthritis of the hip. Our findings are in consonance with the findings of Pachore et al. and Singh et al., who found the incidence of AVN of 49% and 42% in Indian and Singapore patients, respectively. Our study showed the underlying causes of AVN in our patients to be 53.33% for trauma and 46.67% for sickle cell disorder. This is in contrast with the findings of Chan et al., who demonstrated alcohol to be the most underlying factor in their group of Hong Kong patients. Nearly 67.74% of our patients are females. This is in contrast with findings of Wapabeti, who had 35.5% of female presentation. Our findings are in concurrence with the findings of Trudelle-Jackson et al., who had a female population of 73.33%. The multimorbidity prevalence has increased worldwide;, hence, we find an increase in the number of patients (65%) undergoing total joint arthroplasty with multiple comorbidities in the past two decades., Almost 48.39% of our patients had comorbidity such as sickle cell disorder, hypertension, and diabetes. The reason for our lower percentage may be due to the fact that our patients are younger. Our patients mean age was 42.2 ± 13.87 as against the findings of Larsen et al. and Vesterby et al., who recorded 67 ± 9.8 and 64 ± 4.8, respectively. Our age group is in keeping with the postulation that demographics of patients for THR have become younger. We used the HHS in assessing the outcome of our THR for the following reasons: first, apart from being a patient self-report, its performance is also comparable to that of a physician administered. Second, a self-report format offers several advantages over a physician-administered format; hence, we gave HHS a greater consideration in its use in evaluating the outcomes of our THR series. Comparison of preoperative and 1 year post op HHS showed a significant difference (P < 0.05) though there was no significance difference between the 1-year and 5-year post op HHS. The comorbidity did not affect the post op HHS (P > 0.05). The reason for this may be attributed to our protocol which inevitably produced a particular cohort of patients whose conditions were adequately attended to before surgery. For instance, every patient of ours was reviewed by a team of medical experts comprised of a cardiologist, endocrinologist, and the anesthesiologist who certified the patients fit for THR, based on the benefit risks ratio. Gender did not play any role in the outcome of our intervention. A comparison of post op HHS did not show any gender bias (P > 0.05). Liu et al. have investigated the gender-specific risk factors and outcomes and found differences in THA, especially with the location of the femoral head center, size and shape of the femoral canal, and trabecular patterns. Although some studies suggested a higher perioperative complication and failure rates in men, some other studies have found similar failure rates and functional outcomes among men and women. At the time of review, none of our patients' radiological assessment showed ascetic loosening. We believe that the reason for this is the timing of our review, as aseptic loosening due to osteolysis occurs 10–20 years after total joint replacement. We had a complication rate of 4.8%, which included limb length discrepancy, pulmonary embolism, and a dislocation that we managed by closed reduction. 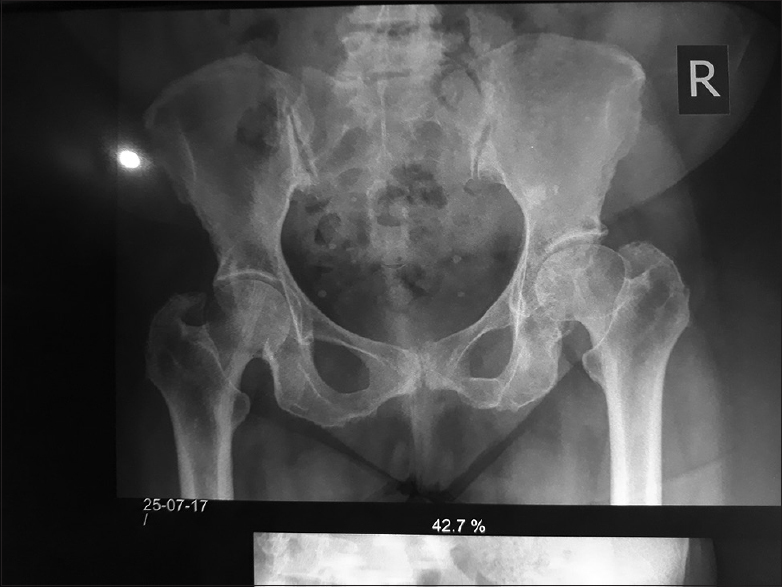 Our patients presented at a younger age and most of them had osteoarthritis secondary to hip joint affectations by trauma and AVN. Our outcome assessment showed patients benefitted from our intervention with very low complication rate. We, therefore, recommend THR for patients with disabling severe OA in our environment. Ibrahim SA. Racial variations in the utilization of knee and hip joint replacement: An introduction and review of the most recent literature. Curr Orthop Pract 2010;21:126-31. Chang RW, Pellisier JM, Hazen GB. A cost-effectiveness analysis of total hip arthroplasty for osteoarthritis of the hip. JAMA 1996;275:858-65. Emejuaiwe N, Jones AC, Ibrahim SA, Kwoh CK. Disparities in joint replacement utilization: A quality of care issue. Clin Exp Rheumatol 2007;25:44-9. Singh JA, Vessely MB, Harmsen WS, Schleck CD, Melton LJ 3rd, Kurland RL, et al. A population-based study of trends in the use of total hip and total knee arthroplasty, 1969-2008. Mayo Clin Proc 2010;85:898-904. National Joint Registry for England, Wales and Northern Ireland 10th Annual Report; 2013. The Swedish Hip Arthroplasty Register Annual Report 2011; 2012. Lai YS, Wei HW, Cheng CK. Incidence of hip replacement among national health insurance enrollees in Taiwan. J Orthop Surg Res 2008;3:42. Nwadinigwe CU, Anyaehie UE, Katchy AU. Total hip replacement in Nigeria: A preliminary report. Kuwait Med J 2012;44:291-6. Ugbeye ME, Odunubi OO. Knee replacement: A preliminary report of thirteen cases at NOHI. Niger J Orthop Trauma 2009;8:63-8. Gogia PP, Christensen CM, Schmidt C. Total hip replacement in patients with osteoarthritis of the hip: Improvement in pain and functional status. Orthopedics 1994;17:145-50. Liu YE, Hu S, Chan SP, Sathappan SS. The epidemiology and surgical outcomes of patients undergoing primary total hip replacement: An Asian perspective. Singapore Med J 2009;50:15-9. Huotari K, Lyytikäinen O, Seitsalo S; Hospital Infection Surveillance Team. Patient outcomes after simultaneous bilateral total hip and knee joint replacements. J Hosp Infect 2007;65:219-25. Mahomed NN, Arndt DC, McGrory BJ, Harris WH. The Harris hip score: Comparison of patient self-report with surgeon assessment. J Arthroplasty 2001;16:575-80. Pachore JA, Vaidya SV, Thakkar CJ, Bhalodia HK, Wakankar HM. ISHKS joint registry: A preliminary report. Indian J Orthop 2013;47:505-9. Singh G, Krishna L, Das De S. The ten-year pattern of hip diseases in Singapore. J Orthop Surg (Hong Kong) 2010;18:276-8. Chan VW, Chan PK, Chiu KY, Yan CH, Ng FY. Why do Hong Kong patients need total hip arthroplasty? An analysis of 512 hips from 1998 to 2010. Hong Kong Med J 2016;22:11-5. Wapabeti J. Determination of the Functional Outcomes of Total Hip Replacement, By Using the Harris Hip Score, In Adults Presenting at Hospitals in Lusaka, A Cross Sectional Study. A Dissertation Submitted to the University of Zambia in Partial Fulfillment of the Requirements for the Award of Master of Medicine in Orthopaedics and Trauma; Cha. 4. 2017. p. 14. Trudelle-Jackson E, Emerson R, Smith S. Outcomes of total hip arthroplasty: A study of patients one year postsurgery. J Orthop Sports Phys Ther 2002;32:260-7. Caughey GE, Vitry AI, Gilbert AL, Roughead EE. Prevalence of comorbidity of chronic diseases in Australia. BMC Public Health 2008;8:221. Vogeli C, Shields AE, Lee TA, Gibson TB, Marder WD, Weiss KB, et al. Multiple chronic conditions: Prevalence, health consequences, and implications for quality, care management, and costs. J Gen Intern Med 2007;22 Suppl 3:391-5. Cram P, Lu X, Kaboli PJ, Vaughan-Sarrazin MS, Cai X, Wolf BR, et al. Clinical characteristics and outcomes of Medicare patients undergoing total hip arthroplasty, 1991-2008. JAMA 2011;305:1560-7. Cram P, Lu X, Kates SL, Singh JA, Li Y, Wolf BR. Total knee arthroplasty volume, utilization, and outcomes among Medicare beneficiaries, 1991-2010. JAMA 2012;308:1227-36. Larsen K, Hansen TB, Søballe K. Hip arthroplasty patients benefit from accelerated perioperative care and rehabilitation: A quasi-experimental study of 98 patients. Acta Orthop 2008;79:624-30. Vesterby MS, Pedersen PU, Laursen M, Mikkelsen S, Larsen J, Søballe K, et al. Telemedicine support shortens length of stay after fast-track hip replacement. Acta Orthop 2017;88:41-7. Ravi B, Croxford R, Reichmann WM, Losina E, Katz JN, Hawker GA. The changing demographics of total joint arthroplasty recipients in the United States and Ontario from 2001 to 2007. Best Pract Res Clin Rheumatol 2012;26:637-47. Liu KL, Wu WT, Wang JH, Yu TC, Wen SH, Chen IH, et al. 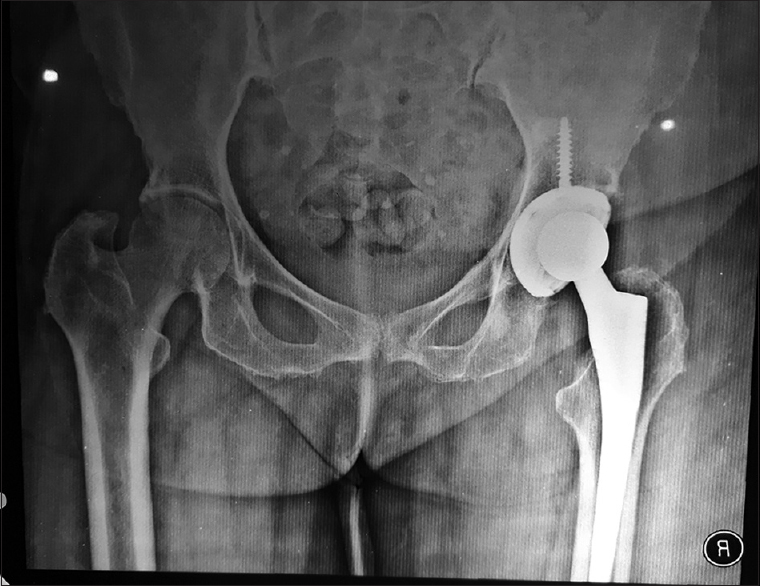 When and how do prosthetic hips fail after total hip arthroplasties? – A retrospective study. J Formos Med Assoc 2016;115:786-93. Bergh C, Fenstad AM, Furnes O, Garellick G, Havelin LI, Overgaard S, et al. Increased risk of revision in patients with non-traumatic femoral head necrosis. Acta Orthop 2014;85:11-7. Hailer NP, Garellick G, Kärrholm J. Uncemented and cemented primary total hip arthroplasty in the swedish hip arthroplasty register. Acta Orthop 2010;81:34-41. Harris WH. The problem is osteolysis. Clin Orthop Relat Res 1995;311:46-53.